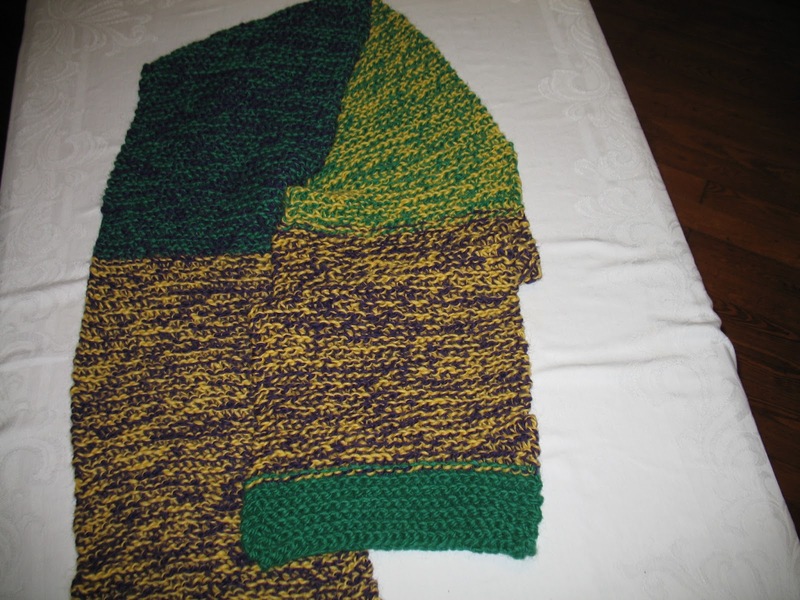 I would like to show you my four recently completed knitting projects. All of these simply used the knit stitch all the way through, using two strands of yarn, each often of a different color to produce a tweed effect. The first two projects are shawls knitted with 25% wool / 75% acrylic yarn. Each shawl used three 200-yard skeins (100 grams, or 3-1/2 ounces per skein) of each color. I used size 11 needles and got about 4-1/2 stitches and about 4 rows to an inch. 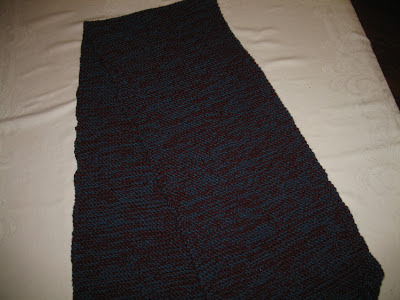 The first such shawl is blue and maroon. It has 45 stitches to a row. 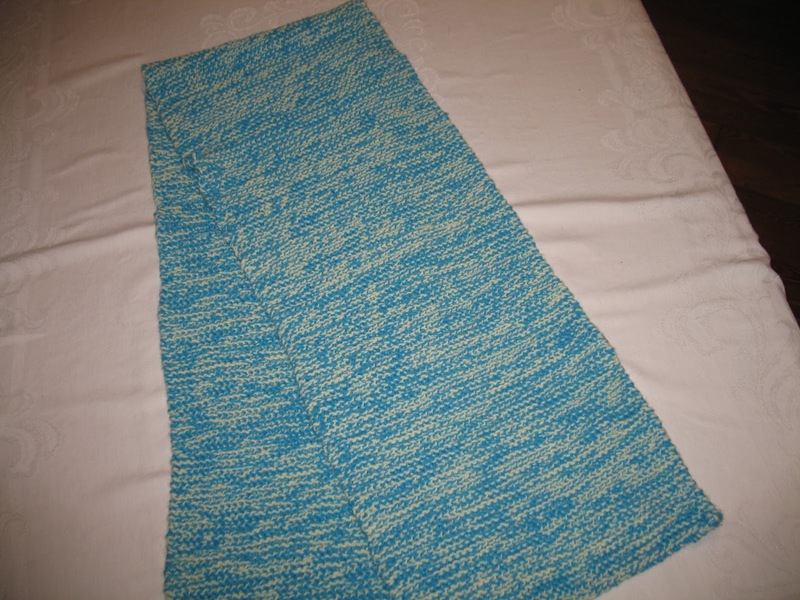 The second such shawl is light blue and white. I started with 45 stitches to a row, but I ended up with 46! I must have inadvertently picked up a stitch along the way! The next project is a Mardi Gras-colored shawl knitted with 100% Icelandic wool yarn. It used three 110-yard skeins (100 grams, or 3-1/2 ounces per skein) of each of the three Mardi Gras colors: purple, green, gold. I used size 17 needles and got about 3 stitches and about 2 rows to an inch. Each row has 30 stitches. 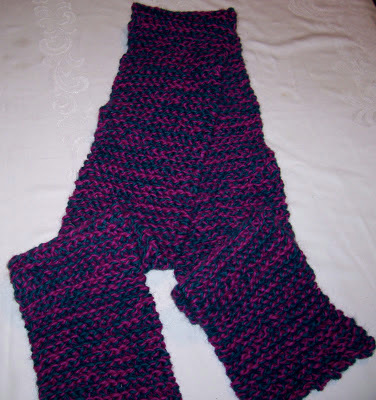 The fourth project is a teal and magenta scarf knitted with 100% Icelandic wool yarn. It used two 110 yard skeins (100 grams, or 3-1/2 ounces per skein) of each color. I used size 17 needles and got about 3 stitches and about 2 rows to an inch. Each row has 15 stitches. My current project, just begun, is a teal and rose shawl. I also have yarn for two additional shawls: one in pastels of blue, lavendar, green, and yellow, and another in the primary colors of a stronger blue, yellow, and red. I will show you these once I have completed them! These are wonderful! Looking forward to seeing the next ones!